Salamandre I think he meant to say it was accessible since it came along with the HD mod, so all you had to to was like turn on the features/mods and download from the HD mod platform? It's been a long time since I last played the hd mod so i'm not sure. posted January 13, 2018 09:10 AM bonus applied by Maurice on 13 Jan 2018. Wait, isn't the newest version available through the HD launcher? posted January 13, 2018 10:45 AM bonus applied by Maurice on 13 Jan 2018. Edited by nik312 at 10:47, 13 Jan 2018. Downloadable through the HotA launcher or by the official link. Edited by OrrinIsTheBest at 11:41, 13 Jan 2018. Tried hota launcher too. It says you have the latest version while it is 1.5.0..
Never mind, downloaded from link. awesome. i think the hota team deserves another round of qp's. I have 1.4.2, and I try to update with the HotA launcher and its say: "no updates". I thought mine wouldn't update because i ended up modifying the game stats with hex editor but apparently you guys are having the same problem too. Uninstalled 1.4.2 and installed the newest one, no problem. Edited by Begrezen at 19:45, 13 Jan 2018. I have a little problem with new map "with sword and fire"
so the map is not playable? Edited by Chrizum at 01:22, 14 Jan 2018. Now I see what you mean. I think you're right, there is no way to not lose 1 centaur in that fight. Perhaps someone of the HOTA staff could chime in? Serious question to Sav, nik312 or someone else from HotA Crew lurking here. Are you planning version 1.5.2 or 1.5.1 is final for now? Strange question as 1.5.1 just released. I would imagine 1.5.2 would only be planned if there are some serious bugs found. It's possible to pass if you take a defensive stance and raise your defense (enough?). I'm not sure if you need to do it only once or several times. I'm not sure it accumulates. However, after splitting the Centaurs into two stacks using one as bait I kept taking a defensive stance until I felt courageous enough to attack and when it retaliated I didn't lose a unit. So it's definitely possible. And probably in a smoother way than I managed to do it. Now I have to beat lots of Nymphs and one Oceanid stack with 4 Energy Elementals. Haven't gotten past that yet. Edited by Chrizum at 03:39, 14 Jan 2018. Edited by Deferatto at 05:44, 14 Jan 2018. Hi, Begrezen! This is my map. So unfortunate that this happen. I make about 40+ tests of this map but boars never get together in one stack (12), they was always 4 4 4... What difficulty do you start with? I'll solve this problem in next update, thx for information, sorry. Actually, it's still possible to beat them, if you press "wait" 1 turn and let them come closer, but it depends of luck. 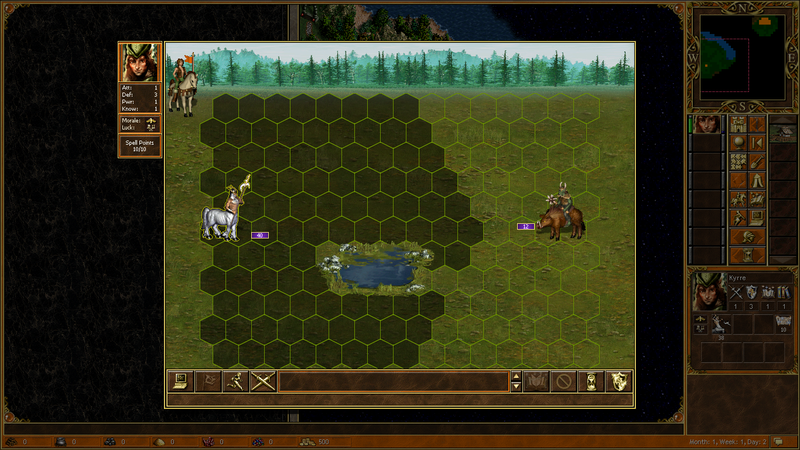 You need to hope that centaurs will kill 8 of them, and 4 boars will not kill 1 centaur in return. You can also try to wait, then go to the corner, and wait again, to refresh random factor.